When we bought our motorhome, we also bought the rigging to tow our Jeep four down. The Jeep, or more generically, toad (as in towed vehicle) needed a supplemental braking system so that when the motorhome was braking, the Jeep would brake too. Our tow rigging provider, South Texas RV Service Center, recommended we use a Patriot braking system. The Patriot has been reliable for us for over 5 years now but we hadn’t been able to shorten the time it takes to get the brake system correctly configured when we are preparing to tow the Jeep. No matter what we tried, it still look us a minimum of 30 minutes (and sometimes significantly longer) to configure the brake. 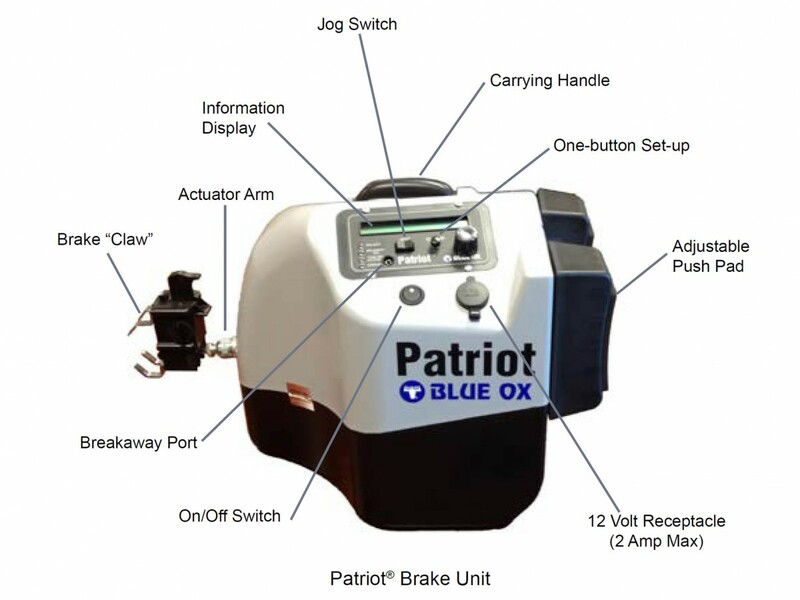 The Patriot, like other similar supplemental braking systems (Brake Buddy) is a box containing a mechanical foot that braces itself on the front seat and then pushes on the brake pedal when braking is needed. The primary advantage of this design is that the device can easily be moved between toad (towed) vehicles. Once the setup button is pressed, the system extends and retracts the arm up to three times in a row. If all works correctly, you get the “Ready” message and the green On/Off light is lit. You are good to go. If things don’t work correctly, you get the “Reposition Brake” message and the red error light is lit. The brake will not operate in this condition. In the above animated GIF, the supplemental brake is positioned between the driver’s seat and the brake pedal. Excessive brake movement causes the setup phase to fail as the brake becomes misaligned every time the brake is activated. We believed the solution would require minimizing supplemental brake movement as the brake arm extended and retracted. First step was to get the floor mat out of the way. There is a plastic hook used to anchor floor mats so they don’t float around and interfere with the pedals. We needed to create a smooth surface for the Patriot brake’s feet. The floor mat anchor hook interfered with these feet. We cut 3/8 inch plywood to fit onto the floor. One notch for a bump in the floor and another notch for the floor mat anchor. A board between the Patriot’s adjustable push pad and the driver’s seat ensures that the backstop for the Patriot is firm and consistent. Another thing we did was raise up the feet. That gave us another touch point where the Patriot can touch the bottom of the dash. When the Patriot is too close to the pedal, the Jeep’s brakes are active and drag while you drive. You can tell if the brakes are active by looking at the taillight. If it is lit after the Patriot’s arm retracts, then you have a problem. Raising the feet, keep the Patriot from being too close to the Jeep’s brake pedal which keeps the brakes from dragging. Putting all of this together and rerunning the setup on the Patriot works so much better than before. In the eight times that we’ve been through the setup process since we figured all of this out, only once did I need to run the setup twice. The following animated GIF shows the new setup process.